Christian Benteke has hit back at his former manager, Aston Villa boss Tim Sherwood, for suggesting that Liverpool shouldn’t sign him because we don’t cross the ball regularly enough to utilise him at his best. However, his plan backfired – rather than convince us too cool our interest, he only further convinced the Belgian that he wanted to move – with the 24-year-old annoyed at subtle suggestions that he was just a ‘target man’. In quotes taken by the Mirror, Benteke has now responded. He said: “I don’t believe that and I told him – I spoke with him and I explained to him the situation. “I said football has changed and football now is modern and I can adapt. It is not just about crossing, I can score normal goals, too. I told him I am not afraid about it. His words will be encouraging to Liverpool fans, many of whom will have had similar fear regarding Benteke and his suitability to our style of play. As The Guardian tells us, he has been compared in some parts with former Reds flop Andy Carroll, but the former Villa man is confident that he can offer much more than that. “I believe whatever level I play at I will score goals. I think the pressure will bring the best out of me. 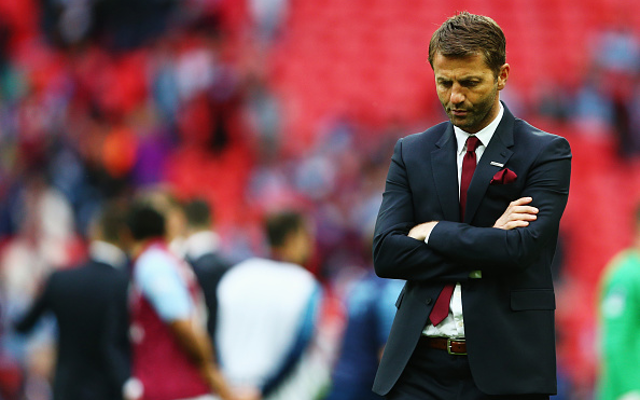 There was pressure at Aston Villa – a different pressure – but I scored goals. Benteke has certainly made a good impression thus far. He scored a brilliant goal on debut, during our pre-season friendly against Swindon Town, and he’ll be hoping that he can continue to prove his former manager wrong. Speaking about his time with Sherwood, he said: “He came in at a good time, at a time when I was getting fit and getting better, so it was like a good time for both of us. The right time for him and for me.